Did Russia Get Its Hands on USAF's High Tech Missile in Syria? "Does Russia now have a relatively intact JASSM missile to study and reverse-engineer? If so, this is without a doubt, the greatest US military technology lossin almost a century"
Like so many others that watched the unfolding U.S.-led cruise missile strike on Syria in the early morning hours of April 14th, I was amazed by the brazen and ill-conceived nature of such an undertaking. Not only was the attack not based on any verifiable intelligence proving a chemical attack by Syrian governmental forces, the given reason for the justification of the attack, but it was extremely ill-advised from any military or political stand point. Was it imperial hubris on the part of the “leadership” of the sole “exceptional” nation, or a simple matter of poor military decision making that resulted in the approval of the strike? A number of failures in executing the strike have come to light after the fact, not minor faults that have been magnified by Russian or Syrian government propaganda interests, but real and fundamental failures that have showcased real weaknesses in frontline U.S., French and U.K. tactical cooperation, as well as new weapon systems and their employment. A number of analyses have appeared online over the past week that have showcased the utter failure of the French Navy’s performance in the strike and the inability of the sole VLS fired LACM in the French Navy arsenal, the MdCN , to launch reliably. Only one of three FREMM class multi-purpose frigates deployed was able to successfully fire cruise missiles within the agreed upon launch interval. The five Rafale carrier-borne strike aircraft taking part in the strike each carried 2 SCALP air-launched land attack cruise missiles, yet it was announced that only 9 SCALPs were fired against targets in Syria. Apparently, one missile malfunctioned and had to be dropped into the sea as not to present a danger to the returning aircraft upon landing. Of even greater import than the obvious failure of the French Navy, was the official announcement by the Syrian military that they had recovered two U.S. cruise missiles that were relatively intact after the strikes were conducted. These two missiles were promptly delivered to the Russian military in Syria. This entire story may just be a propaganda or military psy-op. on the part of Russia, but if true, what could be the possible implications? If true, it would not be an extremely disastrous development for the U.S. if both of these cruise missiles were a more modern variant of the Tomahawk. This missile is based on technology developed in the 1970s and 1980s. The Tomahawk is a legacy U.S. weapon system. Although increasingly modernized over intervening decades, the Tomahawk is far from cutting edge as guided missiles are concerned. Such a development would definitely aid the Russian military and defense industry in not only furthering the development of Russian missile technology, but more importantly, in developing countermeasures to defeat U.S. guided munitions. Very early after the strikes were conducted, the U.S. Air Force made it known that B1-B strategic bombers also took part in the strike. These bombers supposedly fired 19 Joint Air-to-Surface Stand-off Missiles (JASSM) at targets in Syria. That is the official record. It is acknowledged that each B1-B can carry 24 such missiles, so it is unclear how many bombers were employed in the April 14th strike, but at least one or more were utilized. The JASSM has been in development since the mid-1990s, and was not declared operational until February of this year. The Syria strike of April 14th would be the first documented use of this weapon system ever in warfare. The JASSM had a quite troubled developmental history, and like so many other U.S. weapons systems, ran considerably over budget. The JASSM is seen as the benchmark of the next generation of U.S. cruise missiles. Did one of these missiles fail and crash land in Syria? Does Russia now have a relatively intact JASSM missile to study and reverse-engineer? If so, this is without a doubt, the greatest U.S. military technology loss (not due to Chinese espionage at least) in almost a century. And the entire episode either stems from U.S. hubris and arrogance, or simple dereliction of duty in approving a missile strike operation that was likely to be marginally successful, and definitely not worth the risk. The Joint Air-to-Surface Stand-Off Missile (JASSM) began development in 1995 with the aim of designing and fielding the next generation of precision, autonomous, guided cruise missile for the U.S. Air Force and U.S. Navy. The Tomahawk (TLAM) land attack cruise missile proved to be very successful in attacking targets in the first Gulf War of 1991. Between this conflict and the start of the JASSM program, at least 357 TLAMs were fired on Iraq, and an additional 13 were used to target Serbian forces in Bosnia. In total, the U.S. armed forces have fired no less than 2,413 TLAMs on targets in seven different countries over the past 27 years. BGM-109C Block III Tomahawk land attack cruise missile. The missile is equipped with a solid propellant rocket booster and discarding two-piece canister to facilitate launch. With the passage of time, TLAMs have been increasingly employed to engage targets where a robust, modern air-defense network is not present. The TLAM is a sub-sonic cruise missile with minimal inherent stealth characteristics. In conjunction with more high tech and stealthy guided munitions that can bear the brunt of targeting and eliminating high value command and control and critical air defense network control elements, the TLAM still has a significant part to play in future U.S. military operations. The JASSM was developed to be just such a high tech and stealthy guided munition. If the weapons prove successful, JASSMs fired from aircraft outside of an adversary’s airspace, and well out on engagement range of air defenses, could overwhelm and destroy key air-defense network radar and command and control assets, as well as the most capable enemy surface-to-air missile (SAM) batteries. JASSM being loaded into the internal bomb bay of a B-1B Lancer strategic bomber. Development of the JASSM was begun in 1995 by Lockheed Martin. Twelve years after the program had begun, the cruise missile had not achieved the level of success required, and an additional $68 million had to be allocated to help salvage the $3 billion program. The JASSM finally was able to pass the USAF Initial Operational Test and Evaluation program, and a contract was signed with Lockheed Martin in 2013 to provide the first batch of 2,000 missiles. 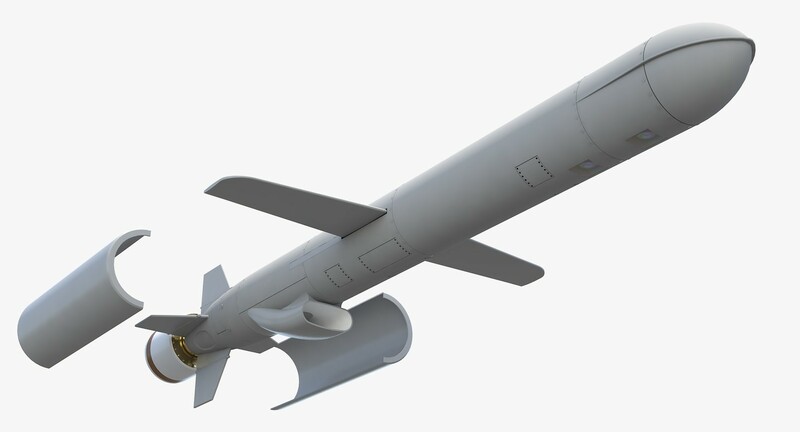 A year later, the Joint Air-to-Surface Stand-off Missile Extended Range AG-158B (JASMM-ER) successfully passed testing and an order for a further 2,900 of these missiles was signed. The JASSM-ER extends the range of the base missile from 370 km. to 1,000 km. Both missiles are fitted with a 450kg. WDU-42/B penetrator warhead. The warhead is fitted with a penetrator fuse that can measure the density of the environment around it so it can determine when it has penetrated a hardened target. The JASSM is guided by an internal guidance system which is programmed prior to launch with targeting information. The missile’s flight path can be adjusted in flight via a jam-resistant GPS receiver. Once the missile enters its terminal targeting phase, it switches over to an infrared (IR) imaging seeker which is able to identify the target via parameters in its targeting memory. This targeting memory can be uploaded with up to eight different target identifications. Lockheed Martin claims accuracy within a three yard radius of target. JASSM being successfully test fired from an F-15E Strike Eagle. The JASSM development parameters demanded that the next generation air launched cruise missile be compatible with multiple strike, maritime patrol and strategic bomber aircraft in the U.S. and NATO inventory. The JASSM has been purchased by the militaries of Poland, Finland and Australia. The missile was initially designed to be utilized by the U.S. B1-B strategic bomber; however, from the very start, it was envisioned that the missile be compatible with a broad spectrum of U.S. aerial platforms, including the F-16C/D, F-18C/D, F-15E, F-35 strike aircraft, as well as the B-2 and B-52 strategic bombers. The P-8 Poseidon may also be a candidate for use of a modified anti-ship cruise missile currently being developed using the JASSM-ER as its foundation. The Long Range Anti-Ship Missile AG-158C (LRASM) is currently being developed by Lockheed Martin as a next generation sea and air launched anti-ship cruise missile meant to defeat near-peer or peer naval targets. There is little doubt that the LRASM is being developed to counter the exceedingly modernized and capable warships developed by China and Russia over the past 25 years. The People’s Liberation Army Navy in particular, has been developing and commissioning extremely capable warships at a rate far exceeding any other navy in the world. As its attention continues to focus on militarization of the South China Sea and Chinese A2/AD, or access and area denial capability in this region, the U.S. Navy will have to develop a more viable means by which to engage and defeat exceedingly capable PLAN surface warfare platforms. Computer generated rendition of a LRASM targeting a Russian Sovremenny Class destroyer. The AG-158 family of missiles have been developed as the benchmark of the next generation of cruise missiles for both the U.S. Air Force and Navy. Significant investment went into the development of this weapon system, and it goes without saying that the specifics behind its design and how it functions must remain unknown to any prospective adversaries, with Russia and China paramount among them. In light of the importance of keeping the specifics of this new technology secret, was it truly a good idea to use JASSM missiles in a pointless assault against Syrian government targets on April 14th? A simple and logical cost benefit analysis would conclude that it was not a wise decision. It is quite obvious to anyone that has ever followed proxy conflicts, that all sides invested in the conflict will use such proxy wars as an advanced training ground for their own weapon systems. There is no doubt that Russia has been doing this in Syria for years now; however, they have been quite reserved in their willingness to use their most secretive and game-changing assets. The S-300 and S-400 systems have not been used, nor have the most state of the art electronic warfare (EW) systems. They have been deployed in Syria for sure, but Russia has wisely decided not to use these systems unless absolutely necessary. As soon as these weapons are used, the U.S., NATO and Israel will be able to gain very real data on how they work, especially from the standpoint of EW. Russia will only risk using these systems, and thus “showing their hand” if they have no other options. Satellite images of the Him Shinshar “Chemical Weapons storage facility” before and after the strike. Were JASMMs used to target these structures? The Trump administration decided to approve a strike plan that included the employment of the JASSM, which had only become operational months before. Whether the decision was made to ensure that the Syrian air-defense network’s ability to interdict and defeat the attack would be minimized by using JASSM missiles is questionable. It was disclosed that only 19 of the missiles were used, accounting for 18% of the cruise missiles used. These were fired from two B-1B bombers. Each of these aircraft can carry 24 JASSMs each. The majority of missiles employed in the attack were the TLAM, fired from U.S. Navy destroyers and a Virginia Class attack submarine. Also, one target alone, the Barzah Research and Development Center, were allegedly saturated by 76 missiles. Use of the JASSM in such an attack would be pointless, as the cruise missile was designed to target and destroy targets with such effectiveness that only one missile would be necessary. This concept is referred to as Missile Mission Effectiveness (MME), and the JASSM was expected to have an MME value of one. What would be the point of targeting a handful of unhardened targets with multiple JASSMs? Two of the three main facilities said to have been targeted and destroyed in the attack was a munitions storage facility and “CW bunker” located in Him Shinshar near the city of Homs. It is impossible to tell from the satellite imagery provided by the U.S. as proof of the effectiveness of the attack, or if these were hardened targets or not. Even if they were, why target them with 19 missiles that each possess an MME = 1? As it becomes clear with each passing day that there was no chemical weapons attack perpetrated by the Syrian government on civilians in East Ghouta, the questionable judgement of using the JASSM in the April 14th strike becomes even more glaring. Why risk the possible recovery of a JASSM, whether largely intact or not, in perpetrating an attack that was not only unnecessary, but one based on a fabrication? Clearly the U.S. intelligence apparatus has greater information collecting means than just monitoring opposition linked Twitter accounts. Was the possible loss of a JASSM and its delivery to Russia worth “success” in a meaningless attack that would yield no real, material benefit? The answer is an unequivocal no. The Russian M.O.D. was quick to verify claims made by the Syrian military that they had handed over two U.S. cruise missiles recovered largely intact, but they did not specify any details. Either this is simply a bluff, or Russia does in fact have these missiles now. Of added significance is the fact that the Russian M.O.D. has yet to specify what type of missiles were recovered, and I would bet that this information is not forthcoming. They will keep the U.S. leadership guessing and fearing that they are currently inspecting one of their newest and most advanced guided missiles, even if they are not. An intact TLAM would be of obvious benefit to the Russian defense industry, but an intact JASSM would be a windfall. Decades of development and tens of billions of dollars could be thwarted in just a few short years, forcing the U.S. defense industry to work to improve upon and safeguard what they saw as the foundation of both air and sea launched cruise missiles guaranteeing U.S. power preeminence through the next fifty years.